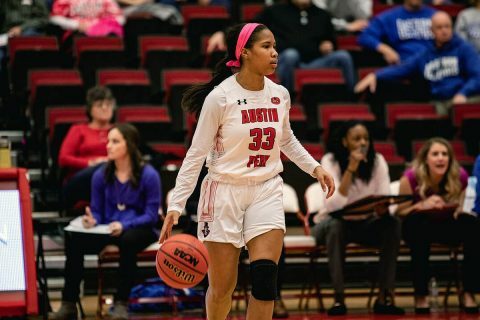 Clarksville, TN – After an instant classic in the Dunn Center last month, Austin Peay State University (APSU) women’s basketball team duels with Morehead State once again, 4:05pm, Thursday, on the road. The Governors (11-12, 6-6 OVC) had a wonderful chance to move up the standings last week, but after handily defeating SIU Edwardsville, fell to Eastern Illinois at home. The Govs did take solace in the fact they were able to get some revenge against the Cougars. At SIUE, the Govs lost in the final seconds, but took control early with some stifling defense, holding SIUE to 16 first-half points, the second fewest the Govs allowed in a half this season. Arielle Gonzalez-Varner recorded her fifth career double-double with a big 13 point, 14 rebound performance as well. Against the Panthers, a team who the Govs defeated for their first road win in January, the first half was a direct opposite of what occurred against SIUE. The Govs made just four field goals in the entire first, leading to only 16 points of their own, the fewest they scored in a half this season. EIU led by double digits for most of the half before the Govs cut it to five with about 90 seconds to go, but the Panthers continued to get to the line and closed the game out. The Eagles (18-7, 9-3 OVC) and the Govs played an absolute thriller back in January, with the Govs rallying from a seven-point deficit with less than four minutes remaining to win by a single point. The Govs were led by Keisha Gregory, who had a season-high 25 points on 8-of-13 shooting. Brianah Ferby, who had 11 points, iced the game with a free throw with mere seconds to go. The Eagles possess one of the most potent offenses in the Ohio Valley Conference, averaging almost 80 points per game. The Eagles pretty much do everything at at least a decent level, but what stands out is their shooting percentage and ability to force turnovers. Their 44.1 overall shooting percentage leads the OVC, while their blocked shots per game (5.5), assists per game (16.6), and turnover margin per game (+6.2) also leads the conference. Morehead has many players that can provide an attacking spark, but the two main threats are Miranda Crockett and Aliyah Jeune. Crockett is possibly the best rebounding guard in the OVC, ranking second on the team with seven rebounds per game. Averaging 17.8 points per game, leading the team, is not too shabby either. Jeune has won multiple OVC Newcomer of the Week awards and ranks third in the OVC in total three-pointers made. Crockett and Jeune were both tough to contain for the Govs in the first meeting, as Crockett went for 22 points and nine rebounds on an efficient 70 percent while Jeune added 21 points. The game will be broadcast live on ESPN+. Morehead State will provide live stats and @AustinPeayWBB will tweet live updates on Twitter.